Dr. Pepper is daring Telemundo viewers to “Try Something New” with a new campaign including on-air integrations with popular hosts and celebrities. The campaign, developed by Telemundo with Dr. Pepper’s agencies Initiative LA and Identity, targets U.S. Hispanic millennials and aims to build brand awareness for Dr. Pepper. The on-air component of the “Atrévete A” (“Dare To”) campaign consists of branded segments in the program “Suelta La Sopa” (roughly, “Spill the Beans”), a popular celebrity chat show. Celebrity guests will join hosts Jorge Bernal and Erika de La Vega as they try unusual or challenging feats they have always wanted to do, generally with a physical dimension; Bernal kicks things off by riding a mechanical bull. In addition to the integrated segments, the campaign will also be promoted with “Daring Moments of the Week” editorial segments on the show, along with custom videos airing during commercial time and cross-promotional segments on Telemundo series like “Un Nuevo Día,” “Titulares y Más” and “Ritmo Deportivo.” Promotions will also appear on NBC Universo. An online component will invite viewers to participate in a photo contest, launching this week, where they share a photo of themselves with a Dr. Pepper logo and write a caption describing something they have always wanted to try. 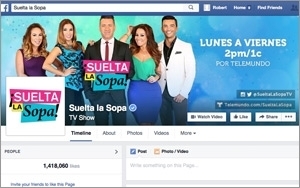 The winner will be flown to Miami to perform the dare on the set of “Suelta La Sopa.” Custom branded digital content will also appear on the show’s Facebook page and Telemundo.com. Dr. Pepper isn’t the only soft drink brand using the theme of dares and challenges, plus celebrities, to boost brand awareness. Earlier this month, Pepsi bowed the Pepsi Challenge, urging consumers to defy convention and “Live for Now,” with challenges led by “Pepsi ambassadors” like Usher, Serena Williams, Usain Bolt and so on.